First - Don't support puppy farming! Please don't support the cruel practice of puppy farming and always know where your puppy comes from! 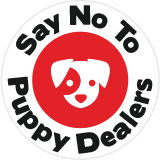 Only buy from a reputable breeder and never from the back of a car, a pet shop or on-line and especially if you can't meet the mother. A good breeder will always want you to come and meet the mum and will want to know about you before you ever get to take a puppy home. Ask to see where the puppies are raised and observe the puppies and the mums behaviour. If you're looking for a breeder, try the Kennel Club site and breed clubs who can help point you in the right direction or consider a rescue. Ask a local vet who are the breeders in your area or go along to puppy classes to find out where people get their puppies. You may have to wait a while to get the puppy you want but it's worth it to get a healthy, happy puppy and to stop the horrible torture that puppy farming brings to both puppies and adult dogs. If you want to learn more click on the logo below. ﻿You've been thinking about getting a puppy. Maybe you know someone with a brilliant dog or you've seen one in a movie that was really amazing, so you want one too. Maybe you fancy something cute to cuddle up with or a strong protector to help you feel safe. If you are truly ready for a puppy, then you'll have really thought it through and spent time researching the breed you like. You'll have chosen a good breeder, bought all your puppy's equipment, identified a veterinary practice, and booked a place at a Puppy School. You're ready to go! However, if you haven't done this, you need to know that raising a dog is a lot of work, rewarding yes, but it takes commitment. Puppies don't come pre-programmed, they have to be taught how to be a 'good dog' and they can't fully control their bladder until around 6 months old! Oh, and no matter what breed characteristics a dog may have, each is an individual with its own personality and quirky behaviours, so you can never be sure what your puppy is going to be like until it lives in your home . Can I afford a dog? Vet bills, food, equipment, etc. Do I have the time for a dog? Dogs are social animals and need your attention! Do I like to walk? This is very important - all dogs, regardless of breed, need to go for walks, every day. Will I train my dog? YOU have to teach your puppy manners - like children, they have to be taught how to behave. Puppy classes are a good start. Will I socialise my dog? To be well-adjusted, a dog needs to meet lots of different people and dogs, as well as experiencing many different environments and situations. Will I be around a lot? Dogs need you to be there for them all their lives, but are especially dependent on you when they're young. Many dogs don't cope well with being alone for more than 4 hours. Puppies can get very distressed when left for even shorter periods and it's best to be able to take time off work when you first get a puppy. DON'T GET A PUPPY OR AN ADULT DOG!